The Rolex Cosmograph Daytona ref. 116523 is the first two-tone reference in the line to run on a calibre 4130 perpetual movement, which is produced entirely in-house. The calibre 4130 beats at a rate of 28,800 bph and offers anti-shock technology for a smooth and reliable reading on or off the race track. The ref. 116523 is also equipped with a durable waterproof Oyster case in steel and gold, a scratch-resistant sapphire crystal, and a 400-kilometer tachymeter bezel that can be used by the wearer to calculate driving speeds. 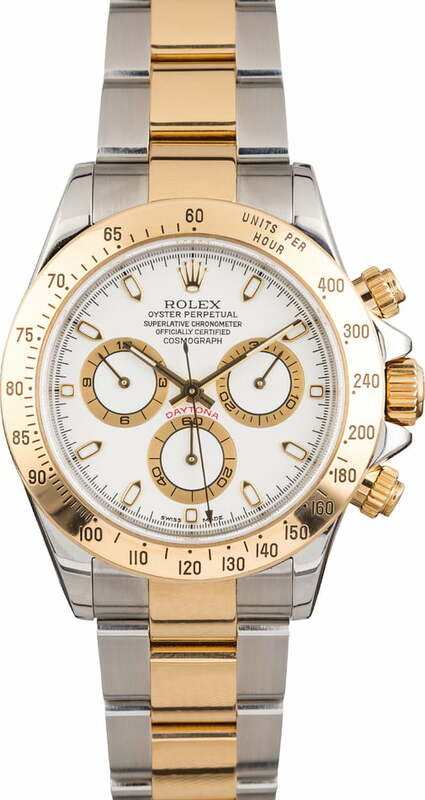 The case also boasts chronograph pushers, which activate the stopwatch functions within the movement. This particular used Rolex pairs the Yellow Rolesor finish of the case and bracelet with a sophisticated white dial, which is topped with luminous markers and hands in yellow gold surrounds, champagne chronograph registers, and a Rolex logo at 12 o'clock.